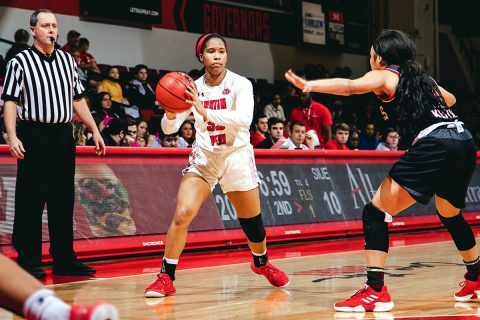 Clarksville, TN – Austin Peay State University (APSU) women’s basketball team goes for its first 2-0 sweep of Ohio Valley Conference opponents since the opening weekend by hosting Eastern Illinois, 1:30pm, Saturday, February 9th in the Dunn Center. The Governors (11-11, 6-5 OVC) remained in a tie for fifth place in the OVC with Southeast Missouri after defeating SIU Edwardsville on Thursday. The Govs allowed just 16 first-half points to the Cougars, their second fewest in any half this season, as they rolled to a 77-65 victory. Arielle Gonzalez-Varner led the Govs with her fifth career double-double, dropping 13 points and 14 rebounds. After recording 19 rebounds the entire game in the first meeting against SIUE, the Govs had 16 in the first half alone (eight from Gonzalez-Varner as well). While SIUE got hot in the second half by shooting 50 percent from the field and from beyond the arc, the Govs did not let SIUE cut the lead to no less than eight points, as they remained composed and used brilliant free throw shooting combined with timely three-pointers to fend off any SIUE comeback attempts. The Eastern Illinois Panthers (9-13, 3-8 OVC) have continued to trend in a downward direction, as they are just 1-4 since the Govs defeated them back in Charleston a few weeks ago. The win at EIU for the Govs was their first road victory of the season at the time as well. The Govs had their highest road shooting percentage in Charleston and used a dominant fourth quarter to pull away. The Panthers got good performances from guards Taylor Steele and Carmen Tellez, but shut down leading scorer Karle Pace back in January. Pace, a Clarksville native, was held to seven points after scoring in double digits for ten straight games going into the contest. Despite their record, the Panthers do excel in some categories. They shoot the ball well from beyond the arc and rank near the top in assists per game and turnover margin in the OVC. However, the Panthers rank near the bottom in rebounding and do not get to the free-throw line often. And when they do get to the line, they only shoot 67 percent, a number that ranks eighth in the OVC. Pace still leads the Panthers in scoring with 15 points per game and shoots just under 45 percent from the field, a great number for a three-point shooting guard. Speaking of three-point shooting, Tellez ranks second in the OVC with a 50 percent three-point shooting percentage. Both teams have three players who rank in the top 15 individually in three-point percentage, with the Panthers boasting Pace, Tellez and Steele in the category, while the Govs are represented by Keisha Gregory, Maggie Knowles, and Brandi Ferby. The game will be broadcast live on WAPX (91.9 FM). Live Stats will be provided and @AustinPeayWBB will tweet updates on Twitter.